Last week Imangi Studios surprised everyone with the stealthy release of the Temple Run 2. Being the finely-honed sequel to one of the most popular mobile games in the world, I can't say I'm surprised by massive reaction. 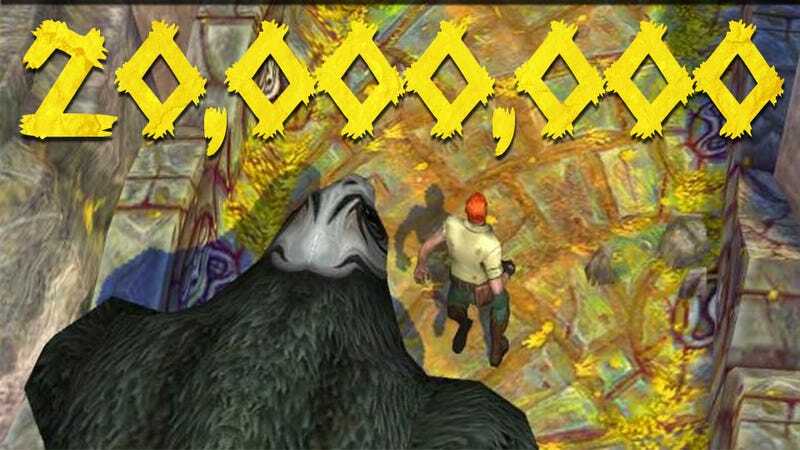 Today Imangi Studios announced that in just four days—from Thursday's release to Sunday evening—Temple Run 2 was downloaded 20 million times. An impressive number made more so by the fact that the game doesn't launch on Android and the Amazon App Store until later this week. This was all iOS. And it's not just knee-jerk grab the free game, play it later downloads either. According to Imangi, more than 210 million game sessions have been initiated since launch—that's an average of 11 plays per download—adding up to some 1,775 years' worth of play. It's current in the number two spot in the iPhone's top grossing list and steadily rising, so folks aren't just playing, they're buying in-game gold and gems as well. "The response from fans has been overwhelming," says Keith Shepherd, co-founder of Imangi via official announcement. "We are thrilled players want more of the Temple Run universe, and we hope to grow and expand the game over the coming months." I'm looking forward to seeing how much that download figure jumps once Android gamers get their hands on Temple Run 2.